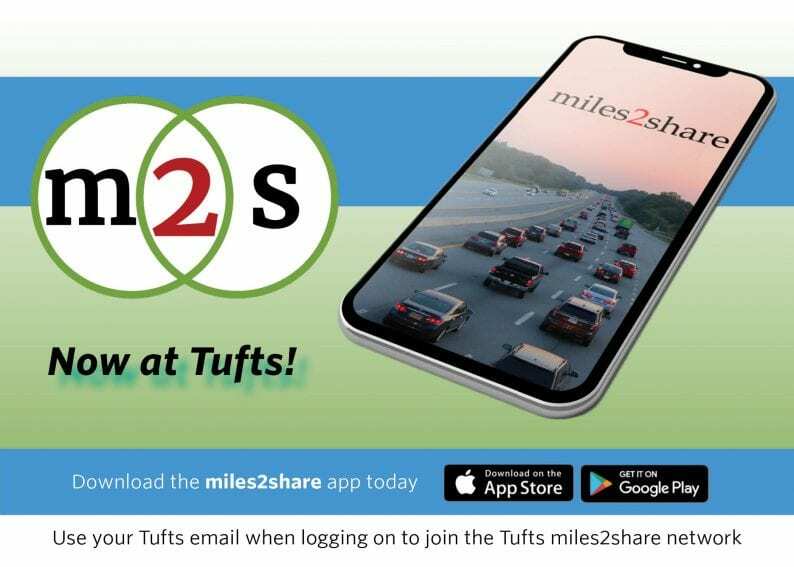 At the beginning of March, Tufts joined the brand new ride-sharing app called miles2share, with an exclusive closed network for the Tufts community. Riders and drivers across all of our campuses can now be connected based on overlapping routes, enabling users to share rides to and from campus, meetings, daily commutes, and more. Check out an article about the launch of the Tufts network featured in The Tufts Daily here! You’ll save money, reduce your carbon footprint, and help make Tufts more sustainable. Download the app and sign in with your Tufts email now to connect with others at Tufts and help build our carpool community. The app will then find others who share your routes, and prompt you to connect with them. Connect to matched people in the app. You can message with them through the app and meet in person before they “accept” you in the app. Then create your Schedule in the app: which days you will be taking which routes, and if you want to be driver or rider. Those in your Circle can join your rides and you will be notified. You can join others’ rides that they set in their schedule. Check the app for rides. A future version of the app will give you a notification every time someone has a ride available for you. The rider will pay the driver through the app once getting in the vehicle. The app will prompt you to do so. Share rides, save money, and reduce your carbon footprint!